All charters depart from the North End Charter Fleet Dock, directly behind the Dockside Restaurant, with quick access to fishing at the north or south end of Hilton Head Island. Redfish, tarpon, sharks, cobia, trout, sheepshead and mackerals are available in these pristine waters at different times of the year. This estuary is protected by state and federal laws and the Port Royal Sound Foundation. These waters and marshes are among the cleanest and most productive in the world. Oysters, clams and shrimp abound. Large schools of baitfish arrive in early spring and the hungry predators show up with them. Fifteen to twenty species of shark arrive in May. These include tiger, hammerhead, bull, lemon and blacktip just to name a few. Port Royal Sound and the Broad River are the best places on the east coast to catch Cobia, Tarpon and Big Redfish. Get ready for plenty of great fishing excitement. All you need to bring is you and your friends ready for action! All tackle, rods, reels and licenses are provided. The Runaway is one of the premier Hilton Head Island Fishing Charters. 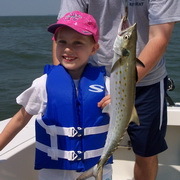 You can book a trip for Off Shore Deep Sea Fishing or Fish Inshore or Near Shore. Your captain and his mate are here to serve you and plan the trip with you. Or just leave it up to the captain - no matter, he will put you on the fish. 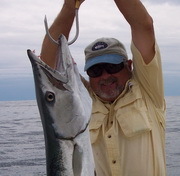 Fishing in Port Royal Sound is perfect during Cobia and Tarpon season. Shark fishing provides a real thrill. Deep Sea, Off Shore Fishing provides a wide variety of great fish such as Barracuda, Grouper, Snapper, Sea Bass, Trigger Fish and much more. Your Captain and his Mate will clean your catch upon return to the dock. 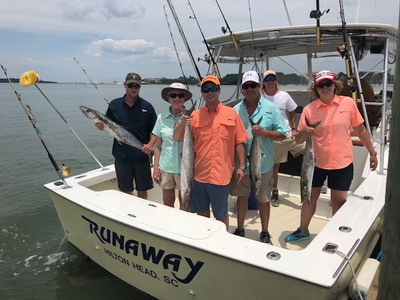 Why choose the Runaway for Hilton Head Island Fishing? Here are a few good reasons! It is true in real estate and in this case – Hilton Head Fishing. Many charter boats have to run a long way to get to good fishing areas. The Runaway is docked at the North End Charter Fleet Dock and can reach good fishing areas in Port Royal Sound and the Broad River in only 15 minutes. Some locations require charter boats to run at idle speed for over 30 minutes and then proceed to open water to get to good fishing spots. You don’t pay for long slow no wake zones on the Runaway. The Runaway is Captain owned and operated by Captain Jackson Larson. He has taken over the Captains position on the Runaway after long time Captain Bill Parker retired in early 2018. Captain Larson was the mate for Bill Parker for over 3 years on the Runaway. Captain Larson knows the boat and the waters around Hilton Head. He learned from one of the best teachers, Captain Bill Parker. The Runaway is 31 feet long with an 12 foot beam. This makes for a smooth ride and allows up to 6 anglers to have plenty of room to fish! It is equipped with a marine toilet, sheltered areas in case of rain or you need to take a short break out of the sun. Even with these advantages, the Runaway is competitively priced - compare rates against similar size boats in other locations and you will see that the Runaway is a great deal!!! Lowcountry Saltwater Fishing around Hilton Head Island South Carolina is superb! Cobia migrate to Port Royal Sound in the spring and make a supreme meal. Shark fishing is great. Sheepshead, grouper, sea bass and others make a trip exciting and fun. Let Captain Jackson know what type of fishing action you are looking for or let him recommend a great fishing trip for you. He will find the fish and make an exciting trip for you and your friends and family. Runaway Fishing Charters also fishes the clear, clean offshore waters for a wide variety of species. Trolling for dolphin and wahoo can be productive and exciting during spring and summer. Our all day specialty trip for bottom fishing is a popular favorite. We drop anchor, give everyone a rod and reel and go to it! You never know what you'll get a hook into: grouper, snapper, sea bass, triggerfish, amberjack and others. They all pull hard! We clean and bag all the fish for you upon returning to the dock - it's included! All tackle, bait, ice and licenses - it's included! Experienced fisherman or novices, Come On! The Runaway is docked at the North End Charter Fleet dock, 2 Hudson's Road, Hilton Head Island SC 29926 - directly behind the Skull Creek Dockside Restaurant. This is the best location on Hilton Head Island for getting quickly to the fishing. It's a quick trip the deep water of Port Royal Sound and the Atlantic. The Skull Creek Boathouse Restaurant and Dockside Restaurant support the Runaway and will cook your catch when possible. Skull Creek Boathouse Restaurant is a great restaurant and features a plaque of the Runaway. Hudson's Restaurant is also a great seafood restaurant. Dockside Restaurant is another great Serg Group Restaurant and the Runaway is docked directly behind it. The Runaway and the North End Charter Fleet support the Waddell Mariculture Center. Carcasses of fish caught during the season are stored on ice and collected by the Waddell Center for research on the migration and habits of the various species, in particular, cobia.